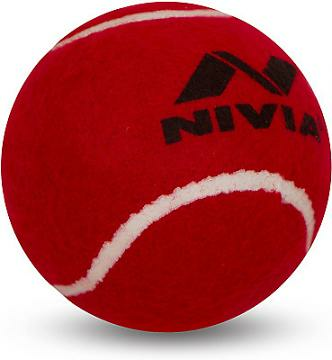 Nivia brand Heavy Hard Tennis Balls for cricket are considered the original and the best for tennis cricket. Ideal for tennis cricket tournaments, outdoor cricket, family event or just playing with friends for fun. Good for all kind of tennis cricket bat. If you plan to play cricket during the day, we recommend red cricket balls for better visibility. Approved by Tennis Ball Cricket Federation of India. Maintain precise balance, pressure and bounce. This item in Outdoor Indian Games category was first added to our catalog on 02-28-2016. Buy Nivia Brand Heavy Hard Tennis Balls for Cricket (6 Red Balls), sold & shipped by Gandhi Appliances where you can shop online for Indian Mixie, Wet Grinder, Pressure Cooker, Mixer Blender & Sports Store. This Outdoor collection has been tagged as Nivia Cricket Balls Best Price, Free Shipping In Usa, Outdoor Game, Buy Cricket Tennis Balls Online.